It all started a year ago with an innocuous little phone call. "This is Indy from an internet company in Potrero Hill," sang the young, friendly voice on the Food Runners message line. "We need a pick up at 365 Vermont Street, Suite A. " The little internet company turned out to be Zynga Games Network, the next big thing according to no less than the Wall Street Journal among others. Indy turned out to be Zynga's Head Chef Indy Roberts. The food turned out to be amazing. The day of the very first pick up, Indy requested that Food Runners start picking up three times a week on a regular basis. Done. 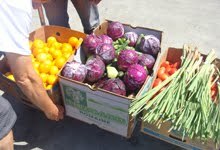 Food Runners volunteers began heading to Zynga every Monday, Wednesday and Friday afternoon. The early reports were glowing. "I loved the pick up at Zynga," raved volunteer Susan Green following her first foray. "I'll pick up there anytime I can fit it into my schedule. "Zynga gave me 6 trays today," reported volunteer Frances Cuanang after her initial run. "There were lots of sandwiches, a tray of super fresh green beans and some delicious looking burritos. The kids at the Vietnamese Youth Develpopment Center went crazy!" Since those early days, Zynga has expanded to pick ups five days a week. The little internet company that started in January 2009 has grown to nearly 1,000 employees. Chef Indy prepares lunch for 700-800 Zynga team members every day. Chef Matt Dutrumble prepares dinner every night for the 400-500 team members who work though the early evening hours. Neither Chef Indy nor Chef Matt can predict how many employees may not care for a given day's menu and decide to step out instead of dining in house. Therefore... leftovers. And what leftovers! Everyday, Zynga's menus are filled with something delicious and nutritious, prepared with care by Chefs Indy, Matt and the rest of Zynga's expert culinary team. Chef Indy is positively passionate about making sure the excess food goes to where it is needed rather than the compost heap. Enter Food Runners. Every day, in the mid-afternoon, a Food Runners volunteer arrives at Zynga's new, much larger headquarters on Rhode Island Street. Things have not slowed down at all. Zynga's donations are bigger and better than ever. "The food that your volunteer brings on Thursdays goes a long way for us," states Jane, a staff member at the Potrero Hill Nieghborhood House. "We serve the children first and whatever is left goes to our seniors." Volunteer Dede Tisone can't say enough about her weekly Zynga run. "The food is so fresh and copious and the Zynga staff is so friendly and helpful. They always bring the food to my car and load it up for me. The ladies at Jelanie House are overjoyed to receive it." Volunteer Candy Heurlin put it simply after completing a Zynga run this past Monday, "this is a great run. Really easy. Good people." Good people indeed! Zynga and Food Runners. Together. Making a difference. Everybody's doing it! The right thing, that is. Every month, more and more businesses are getting into the Food Runners act. New donors in the month of July include: Mission Community Farmers Market, Upper Haight Farmers Market, Inner Sunset Farmers Market, Prima Cosa Caffe and The Jim Joseph Foundation. Food Runners also welcomed ten new volunteers this past month most of whom were off and "running" within 36 hours of signing up! San Franciscans love helping their neighbors. Are you ready something really special? Make your September dinner reservations at Commonwealth Restaurant. Commonwealth is a Progessive-American restaurant located in the heart of the Mission District. Chef Jason Fox and team craft inventive tasting menus from which a portion goes to local charities. From now through September 26th, $10 from each tasting menu will go to Food Runners. Thank you, Commonwealth! The dog, or in the case of San Francisco, the "fog" days of summer are here. Are you hosting a big ole barbecue or a picnic this month or know someone who is? Undoubtedly there will be leftovers. Don't throw them away! Food Runners will pick them up with a smile. Getting food to your fellow San Franciscans in need is just a phone call away at 415-929-1866. Food Runners can't wait to hear from you.